It might seem incredible today, but there used to be a ski-lift operating on the small hill opposite the hotel, at the back of the Himfy Castle. Although we doubt that this place will ever be famous as a ski resort we can conclude one thing for sure: the place is ideal for course riding. It is difficult to find any other location which would better suit a ride than the gentle slopes and beautiful woods of Bakony. 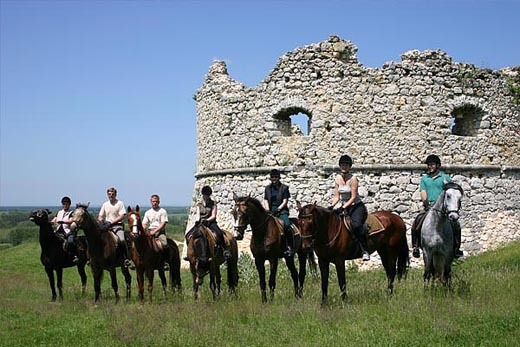 With the help of the trained instructors of the hotel as well as the tranquil and balanced horses in the stable anyone can get to know the magic of horse riding. We offer rides for everyone ranging from beginners to the professionals, from adults to small children, from individuals to groups. Those reluctant to mount a horse can try our carriage drives to wander about in the exquisite woods nearby. Children’s favourites include the pinto pony Tímea, Pedro the small dog, Kormi the cat and Ördög (Evil) the donkey. "Course riding is life pleasure embodied. The horse moves freely and you are surrounded by the magic of a perpetually changing, always exciting nature. The horse makes distances dwarf. We can reach places which cannot be accessed by other means of vehicles. We can approach the game quite close without frightening them off. We experience the life of our ancestors, we imagine that our conquering chieftains, brave soldiers of the border fortresses, the kuruc and hussars – our forefathers saw the world from the same perspective The horse and the nation became one in many fields of life for long centuries. Transport, travel, hunting, fighting, work all performed from the saddle or the carriage and mainly on the land. 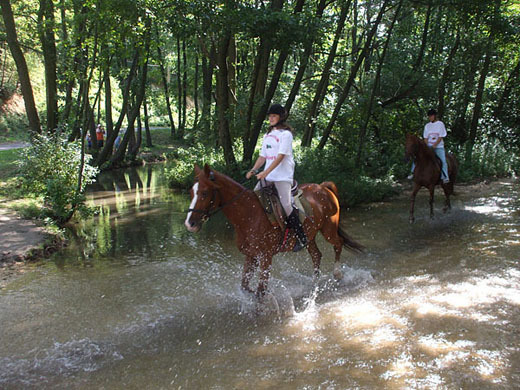 The company of our four-legged friend might be the most pleasant during course-riding."